I originally wrote an outline of this story for a Toastmasters speech that I gave on September 28, 2009. It was my fifth speech in a series of ten I have to give to earn my Competent Communicator designation. The purpose of the speech was to use stance, body movement, gestures, facial expressions and eye contact to improve my speech. Toastmasters calls the fifth speech, Project 5, “Your Body Speaks.” I delivered the speech in 6 minutes, 40 seconds. Here is an expanded, more detailed version of the speech. I’m going to tell you a story about something that I participated in almost thirty years ago. The Growth & Communication program was for graduates of the Relationshop workshop. (I previously wrote about Relationshop in “Thanks for having the courage to be here” and “Let Your Love Flow and Relationshop.”) The GCP was “an advanced level program focusing on accelerated personal growth and enhanced communicative ability for those who wish to share Relationshop in a very special way as a Relationshop Prospective Leader.” The GCP program took place over a three month period. We met for several weekends over that time period, usually in a Manhattan apartment in New York City. One weekend was spent reviewing the Relationshop workshop and one weekend was spent assisting at the workshop. The final “graduation” weekend was held at a retreat and study center called Kirkridge, on the top of a mountain in Bangor, Pennsylvania. It is just south of the Pocono mountains. On the other side of the room was a single chair. The far wall was made of sliding glass doors. There were drapes over them to darken the room. In front of the sliding doors there were mats placed on the floor. They were similar to the mats that you would find in a gym class. In the middle of the room several mattresses were stacked up, one on top of the other. They were waist high. There were a couple of rolled up newspapers about the size of a baseball bat on the mattresses. We were going to beat the mattresses with the bats. We were supposed to yell this throughout the event, until everyone had their turn to beat the mattress. We started yelling and the first person moved to the empty chair. There was a person standing by the chair whose job it was to get you angry enough to grab the bat and start beating the mattress. I will call her Miss B. After a short while, the person got up from the chair, grabbed the bat and started beating the mattress. There were two people at the mattress to assist the person and make sure no one was injured. When the first person was totally exhausted, Larry, who led the GCP and was supervising the goings on in the room, must have given a signal to the assistants that the mattress beater had had enough and to take them over to the mat and let them recover. Then, the next person went through the same thing. When it was my turn, I went over to the chair. In a very short while Miss B. (not her real name) made me so angry that I wanted to grab her instead of the bat. Instead, the two assistants muscled me over to the mattress and put the bat in my hands. I beat that damned mattress for all it was worth. I was soon exhausted and they took me over and dropped me on the mat. I was on my knees and I said something to someone else on the mat. I then took off my shirt, leaving only my undershirt on. I then collapsed on the mattress. A few seconds later, the two assistants were picking me back up. Someone thought that I wasn’t exhausted enough because I had the strength to take off my shirt, I guess. I had to go to the back of the line and do it all over again! I wasn’t too thrilled, but I did it. I remember that the second time I beat the mattress, my back was killing me. My arms ached and I was sweating profusely. Finally, I was put back on the mat. Later in the evening we were each given a small marble. The marble was supposed to represent something we wanted to get rid of. We then went outside through the sliding doors and threw the marbles into the woods. It was a pretty intense weekend. 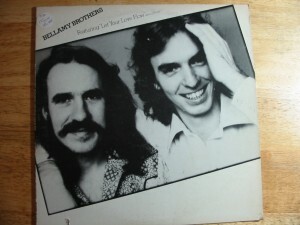 The Bellamy Brothers Album Cover from 1976 featuring "Let Your Love Flow." Howard Bellamy is on the left and David Bellamy is on the right. Dr. Michael F. Valente and Dr. Lawrence D. Lewis were the co-founders of Relationshop. I wrote about Larry in a previous post called, “Thanks for having the courage to be here.” Larry lived in Princeton, NJ. Michael taught at Seton Hall University and moved to Santa Monica, California in the early 1980’s. The workshop was held in a hotel ballroom. It began on a Friday night and usually went into the early hours of Saturday. It started again on Saturday morning at 9:00 AM and went into the early hours of Sunday morning. It started again at 9:00 AM Sunday morning and went late into the night. There were breaks during the day and a dinner break sometime in the evening. The Bellamy Brothers song was played at the very end of the weekend. During the weekend there were lectures, discussions and what Larry called “experiments.” Sometimes the experiments were done individually, sometimes with another person and sometimes with the entire group. Relationshop was a powerful, life-changing experience for a lot of people, myself included. If you click here, you can watch a recent video for Barclay’s Bank in England with the Bellamy Brothers original version of “Let Your Love Flow” playing. According to the credits on the back of the album cover, “Let Your Love Flow” was written by Larry E. Williams. According to Wikpedia, Larry Williams was a “roadie” for Neil Diamond. If you visit the Bellamy Brothers website, you can see a video of them performing a new song called “Guilty of the Crime” (with Kevin Bacon and his brother Michael. Kevin Bacon really is everywhere). I am almost certain that Howard Bellamy is the one on the left on the album cover. David Bellamy is on the right. Howard’s picture on the album cover looks a lot like Larry Lewis to me. I don’t remember noticing that in 1980 when I first saw the cover. I’d love to hear from any Relationshop graduates out there who run across this post. In March 2010 it will be 30 years since my first Relationshop weekend. It seems like yesterday. Can Kindergarten Scar You For Life? Can one stupid incident in kindergarten scar you for life? Can it hold you back from doing certain things for years, until you are finally able to overcome your fear? Yes. It can. I still remember being in kindergarten at Hamilton Square School. It was 1958. Fifty years ago. I can still see the teacher in front of the class. I will call her Mrs. L. instead of using her real name. I was sitting far to her right in the first row. She asked the class a question and I was eager to answer. I stood up, waved my arm wildly in the air so that she would see me and yelled, “Hey Mrs. L., hey Mrs. L.” She turned and looked at me and admonished me for saying “hey.” I can’t recall exactly what she said, but the whole class laughed at me and I sat down embarrassed and dejected. It took me 23 years to get over that. I don’t think that she meant to “scar me for life”, but I’m also sure she didn’t realize how much she hurt me either. Whenever I think back to how I became afraid to speak in front of a group, this is where it leads me. Except for the antics of one young boy who didn’t want to leave his mother at the beginning of the year, this incident is all I remember from my first year of school. In fourth grade my class put on a play about Christopher Columbus. My best friend played Columbus and I was in charge of pulling the curtain. I did not want to be on the stage facing an audience and having to recite lines. In fifth grade one day, my teacher asked me to go to the front of the class. He then began grilling me with questions about what I was going to do on my summer vacation. That was just torture to be in front of the class like that. I was enormously relieved to be able to sit down again. I don’t recall every incident in middle school and high school where I had to give a report in front of the class, but I do know that I dreaded every single one. Dreaded. I would worry about it constantly from the time the assignment was given, until it was over and somehow I survived. I was involved in all of the class plays, but behind the scenes working the lights. I knew the actors on stage and I admired them and respected them just for getting up there. I dropped out of a college Sociology course after the first class, when I learned I was going to have to give a presentation to pass the course. It’s interesting to me, writing about this, and remembering that I played organized baseball from the time I was 9 until I was 18. I pitched in Little League, Babe Ruth League and Senior Babe Ruth. When you are the pitcher, everyone is watching you and you are the center of attention. That never bothered me. In fact, I liked it. I was very confident when I was pitching, even when I wasn’t pitching well. I just never connected pitching with speaking in front of a class or being on stage in a class play. In 1980 I participated in a three day workshop in New York City called RelationShop. I have already written about some of that in a previous story, “Thanks For Having The Courage To Be Here.” In the workshop there are two co-leaders and several assistants who help them. They run microphones, hand out name tags, keep the room clean and make sure the chairs are lined up straight. I volunteered to assist at several workshops. At the end of the workshop, the assistants are invited onto the stage to be recognized. Now, you don’t have to give a speech. You don’t even have to say anything, I don’t think. You could probably just smile and wave if you wanted. Of course, on the last night, just before this is supposed to happen, I am freaking out. I did not want to have to go onto that stage. No way. Fortunately, some of the other assistants supported me. I explained the situation and how panicked I was to Carla. She supported me by holding my hand and walking onto the stage with me as the other assistants followed. Carla was a Montessori school teacher at the time. I might have even been first in the line on stage. Larry, one of the co-leaders of the workshop, was standing a few feet away. I remember starting out by saying something about how terrified I was just to be in front of so many people. I think there might have been 70 people in the room. I can’t remember exactly what I said, but I ended up talking for 20 minutes! Someone said it was the longest “thank you” speech that anyone in RelationShop had ever given. I remember that the audience was very supportive of me too. Once I admitted that I was scared to death, I just kept going. I got a big round of applause from everyone at the end. It was a really big deal for me. At the end of 20 minutes, I wasn’t afraid anymore. I think that was the day I finally graduated from kindergarten. I was 28 years old. A week later, I went to a Retrospective for the workshop in New York City. It’s an opportunity for graduates of the workshop to get back together and introduce their friends and family to RelationShop. One of the participants who heard me give my 20 minute talk, asked me if I would come to Rockefeller University, where he worked, to give a talk about the workshop. It took me a minute or two, but I said yes. I went there a few weeks later and spoke for quite a while to a group of approximately 100 people about the workshop. I didn’t have any fear or anxiety. It was quite amazing to me that I could do that. In the years since, I have been able to speak up at meetings and events with out any fear. It is truly one less thing to worry about. I’ve read that fear of public speaking is the number one fear that some people have. Jerry Seinfeld even made a joke that some people would rather be the dead body in the casket than give the eulogy at a funeral. I don’t know about that. If it is such a big fear, why don’t schools try and identify kids who have it and help them? The younger the better. I would have been a much better student if I wasn’t glossophobic all through school. I don’t recall ever hearing the word glossopobia until recently. The name comes from Greek, glossa, meaning tongue and phobos, meaning fear or dread. There is even a website called, “Glossophobia.com” where you can read more about it. I went to my first Toastmasters meeting recently. Steve Pavlina has written some stories about Toastmasters on his blog. Those articles got me interested. Then, a few months ago, I found out through a story in the newspaper, that a good friend of mine belonged to a local Toastmasters group. For some reason he never mentioned it. That is kind of ironic when you think about it. Toastmasters International helps people become more competent and comfortable in front of an audience. I really enjoyed my first meeting. It lasted about two hours. Everyone was very nice and I really felt comfortable. I will be going back next week to give my “Ice Breaker” speech. I would love to hear your comments about this topic and about this post. The building in the picture at the top of this post is where I went to kindergarten. It was called Hamilton Square school at the time. 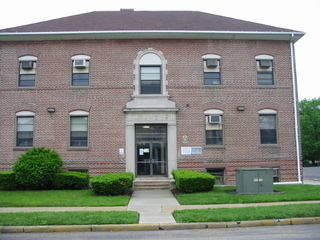 It has been the Board of Education building for at least 25 years, maybe more. It’s hard to see in the picture, but over the doorway it says, “Knowledge Comes, But Wisdom Lingers.” There are also four icons below the saying. They are an open book, a candle in a candle holder, a lamp that looks like if you rubbed it a genie would come out and a globe. My kindergarten class picture was taken in front of these doors. I still have the picture. In January of 1980 I met Larry Lewis and he changed my life. At the time, I was a meter reader for Public Service Electric & Gas company in central New Jersey. Dr. Lawrence D. Lewis lived on Mt. Lucas Road, in Princeton, NJ in a house he called “Ivy Stone Manor.” It was a small house made of gray stone. My meter reading route started about a mile down the road. It usually took me about an hour to get to his house. While I was working my way there, a John Denver song would be going through my mind. It was called Farewell Andromeda, (Welcome To My Morning). It begins, “Welcome to my morning, Welcome to my day, Yes I’m the one responsible, I made it just this way. I’ll get back to this song a little later in the story. 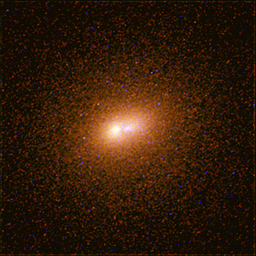 The image is a picture of the core of the Andromeda Galaxy (M31) taken by the Hubble telescope. A lot of times when I went to Larry’s house he wasn’t home. This particular day, he answered the door and let me in. I went down into the basement to read his electric meter. I’m not exactly sure why, but I had a very strong thought that I wanted to say something to him. It might have been that, at the time, I didn’t know what kind of doctor he was. When I came back upstairs I said to him, “You look different. Did you shave off your beard?” He said that no, he hadn’t had a beard in a very long time. He had a stack of photos nearby and showed me one in which he had a beard. We started chatting. Although I can recall a lot of this as if it was yesterday, I don’t recall the whole conversation. He eventually told me that he was a psychologist and led a workshop called RelationShop. He started telling me about RelationShop and handed me a pamphlet that I could take with me. I told him that was really interesting because I had just separated from my wife a few days ago. I sat out in his driveway for a few minutes in my gray Plymouth Valiant and read the pamphlet. One of the things it said was: The purpose of RelationShop is to provide the participants with the opportunity to experience the truth about love, sexuality and relationships so that frustration, effort and scarcity in these areas can be supplanted by mastery, spontaneity and fulfillment. I still remember that after 28 years. I went to a couple of “Prospectives” in the area. They were events that graduates of the workshop put on in their homes so that you could get an idea of what the workshop was like. I signed up at one of them and was scheduled to take the workshop the first weekend of March in New York City. That was one of the first obstacles for me. I didn’t particularly like going to NYC, even though I only lived an hour away. The city was too crowded for me and everyone was in too much of a hurry. RelationShop took an entire weekend. It started on a Friday night and went into the wee hours of the morning. Then you had to be back at 9:00 AM Saturday morning and it went late into Sunday morning. On Sunday, it would start at 9:00 AM again and it didn’t end until the early morning hours of Monday. There were a few short breaks each day and a longer dinner break in the evening. It was held in a hotel ballroom. Over the course of the three days, Larry and his co-leader Dr. Michael F. Valente talked about love, sexuality and relationships and guided the group through various “experiments” to help you to experience what they were talking about. There were probably around 70 people in my “class.” There was discussion and sharing before and after each experiment. You had to raise your hand to talk and someone would run over and hand you a microphone. People shared some very personal stuff. At the time, I was pretty terrified to say anything at all in front of a group of strangers. I listened to everything that was said on Friday and Saturday and participated in every experiment, but I never raised my hand and I never asked for the microphone. At the end of Friday night, people who were assisting at the workshop, helped people like me who didn’t have a place to stay, share a room with other participants. I ended up staying in a very nice apartment with a great view, somewhere on the east side of Manhattan. Saturday was a particularly difficult day in the workshop for me and by the end of the day, I really did not want to be there. that night came out to the balcony and said that I should probably get some sleep because it was going to be another long day tomorrow. I went to bed still thinking about how I could get out of the final day. I went back to the workshop Sunday morning. At one point I was speaking to the woman sitting next to me. She thought that I should share it with the group and grabbed me by the arm and raised my hand for a few seconds. Now, I know that Larry and Michael had to see this because they didn’t miss a thing and it was right in front of them. They didn’t call on me though and no one handed me the dreaded microphone. Sometime after that, the group did another experiment. I think it was called the “Be With” experiment. In it, you just walk around the room and go up to the other members of the group, one at a time, and be with them. You don’t say anything. You just look into the other persons eyes and “be with them.” It might last 10 seconds or a minute. It’s not a staring contest. I went up to Larry who was standing on the stage and did the experiment. He looked me in the eyes and after a few seconds, held me by the shoulders and said, “Thanks for having the courage to be here.” That is one of the nicest things that anyone has ever said to me. “Thanks for having the courage to be here.” His timing was perfect because it just lifted me up. He must have known what a difficult time I was having and how hard it was just being in that room. We did one particularly heavy duty “experiment” late Sunday and there were more discussions and sharing. After that experiment, we were sent on a dinner break. Larry told everyone that the “worst” was over and to make sure to come back after the break. He said that in some previous RelationShops, people had failed to return from the break thinking that they couldn’t take anymore. They will never come again. I kind of thought that John Denver had been telling me my future. I have always thought that the line should have been, “And if the truth is told, we will never be the same. When everyone was back in the room and the workshop started again, I felt as if a giant burden had been lifted. I felt giddy, like Scrooge on Christmas morning, after the three spirits had visited! A lot of other people seemed to be in good spirits too. I’m sure part of it was knowing that the weekend was almost over! I actually raised my hand and took the microphone. I asked about the song and no one seemed to know if it was in fact Farewell Andromeda. Someone did volunteer though that it was the first time I had shared all weekend. Larry then explained our relationship and how I had found out about the workshop. That weekend changed my life. One of the things I realized is that I wasn’t as separate from other people as I thought. Many people share the same feelings that I do about a lot of different things. The words that come to mind are, “once I was different, now I’m the same.” I have a lot more in common with everyone else than I do differences. My son was born in December of the same year. I left my job within two years of the workshop, looking for something more meaningful. I started reading authors like Louise Hay, Wayne Dyer and Jane Roberts. I went on to become a volunteer assistant at some of the workshops. I repeated the workshop as a participant, to experience what I had missed the first time, when I was afraid and just trying to survive the weekend. I made some interesting new friends and spent a lot of time in New York City. RelationShop was similar to, but not the same as, Erhard Seminars Training (est), a very popular workshop in the seventies and early eighties. I never experienced est, but I did go to Newark, NJ one night with Larry to hear Werner Erhard speak. John Denver was an est graduate and on their board of directors. His song “Looking For Space” was written about est. I am so glad that I acted on my impulse to talk to Larry that January day.